We check out Sentinel Butte often. It stands right next to it’s slightly shorter brother, Camel’s Hump (above). Sentinel Butte is south of the Interstate, Camel’s Hump is north. The contours and shapes are apparent in B&W. Geology — a geologist would be good to take along. The saddle between the two peaks on Sentinel Butte. This time of year, there’s a bit of snow on the otherwise barren brown ground. It makes it easier to see the contours and shapes of the North Dakota Badlands. Geology peaks out. So, we take advantage of the days when the light is good to check out the lines of the Badlands. Sometimes it’s been very cold, but so far this fall, we’ve caught the warmer days with good light. We’ve been hanging around the south end of the Badlands looking for those scenes that can present a romantic or nostalgic feel, such as the schoolhouse at Carlyle, Montana. We are looking for those kinds of scenes that would have been shot decades ago. Carlyle school is built on a basement — unusual. But it makes a good barn, too. West of Medora, south of Camel’s Hump. Earlier this year we stopped in at the Alpha Country Club. There wasn’t much happening. It had been a while (years) since it had entertained guests. There’s a stage, but the piano is not on it. Sad. The upright piano sits in the corner. How about those footprints on the lower face, (kick panel). A dog print? It probably used to play some pretty good dance music at the Alpha Country Club. And of course, the stars of the South Unit of the Theodore Roosevelt National Park are usually pretty good about making an appearance on their stage. Bison are often spotted easily from the scenic road, or with a short hike over a rise. Sauntering down the path at the South Unit of the Theodore Roosevelt National Park. Along with their “buddies,” the wild horses, bison range all winter in the Park. It seems that when the bright lights and the colors are removed from the landscape, more of the contours and textures come out. Right? We’re looking forward to getting out there again this week to explore the south part of the North Dakota Badlands. We’re looking for school houses, church buildings, landscape and wildlife that look good monotone or b&w. Maybe you have a favorite scene that looks like it came out of a 1940’s movie? Since you’ve read this post, this far, here’s a sidetrack to take to see what this gallery of BW Badlands photos is becoming. Good Christmas present ideas there, too! We’ll show ya what we come up with. Just let us know your email address so we can send to you a note that a new article is up. 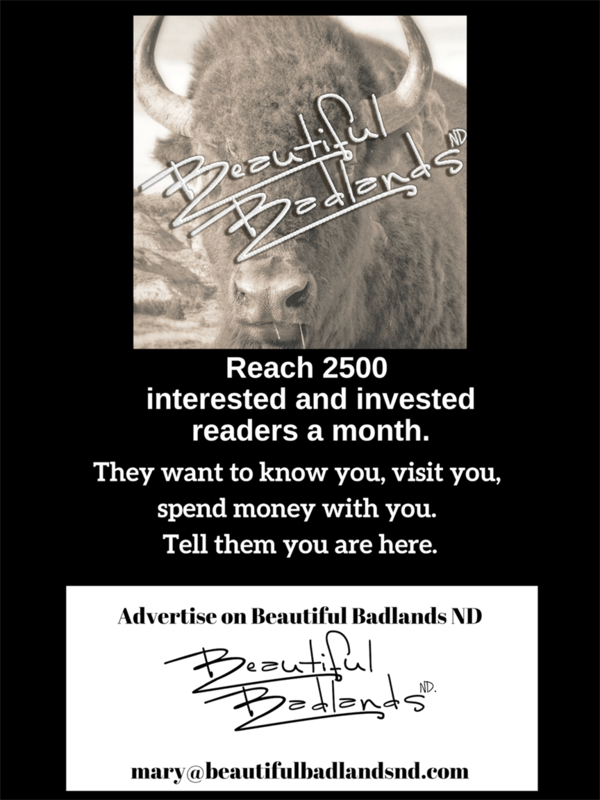 Facebook works, too — much more activity over there on the Beautiful Badlands page on Facebook. Of course, you are probably already staying up to date on all the events in Western North Dakota. Those events are here on the Things to Do Calendar. Or you can get this free resource guide. It’s 10 of the best resources for local calendars to show you what is happening around the region. Free!